I would like to introduce to you the lovely author Debbianne DeRose. Author of What I Did On My Midlife Crisis Vacation. 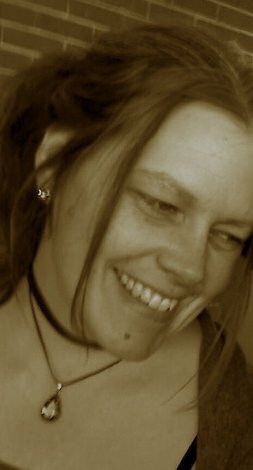 I first want to thank Debbianne for allowing me to spotlight her on my blog and to thank her for her neverending patience. I've recently had some tough family health/loss turn of events and Debbianna has had to wait a bit for her spotlight. Well, here she is and she sounds wonderful! I stole her lovely pic from her author central page, love it! Debbianne's great personality just shines out of that picture! I am also adding her book to my To-Read list on Goodreads. From the book description, I'm gonna love reading this book! 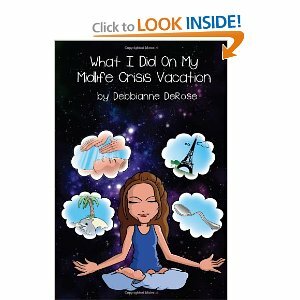 Stay tuned, Debbianne 's book will be in one of my upcoming giveaways! Click on the word giveaways at the top and go check out the blog giveaway hops I am participating in and calendar them in to look out for Debbianne's and see the other great reads I'm giving away! This saucy memoir is the oh-so-honest and humorous account of the authorâ€™s personal journey through a string of compelling adventures and ideologies of the woo-woo kind. Her story begins with confusion and discontentment that catalyzes bold life changes and sends her roaming in search of magic, miracles, and a deeper grasp of the metaphysical nature of reality. In a unique style akin to confessional reporting, she shares with you her keen insights into human behavior as you meet a plethora of colorful characters and occasional charlatans. With some good belly laughs, she effectively sorts out the wheat from the chaff---both within herself and the New Age world sheâ€™s romping in. It becomes an inadvertent healing pilgrimage full of expansive revelations, and through the process of en-lightening up she emerges clear-headed and self-empowered with inspiration to spare. Currently, its the Bay Area (San Francisco). But its been a lot of places over the years---Ive got gypsy blood in my veins. 2. What is the title of your most recent book? What I Did On My Midlife Crisis Vacation, which is a true tale of woo-woo (that is, metaphysical, spiritual, paranormal, New Agey) pursuits and honest introspection. 3. What's your Genre? Confessional reporting. My book is a Memoir, but it might also be filed under Humor or slice of life. No matter how you slice it though, its definitely non-fiction. 4. Plans for a next book? Is this part of series? Yes! Im currently working on How I Met the Man of My Dreams: Reflections on the MANifestation Process, which will be released in late 2012. Its kind of a sequel because I met the man of my dreams just as I was finishing What I Did On My Midlife Crisis Vacation. My friends asked if I would be adding the love story onto the end, but I decided against it. I like how it resolves on a strong-single-woman note rather than a convenient Harlequin-esque ending---that would have made it seem formulaic with regard to Eat Pray Love. So instead, the new book sort of picks up where it left off. The point I'm making is that once I decided to be genuinely happy and okay with being single, thats when Love walked right in, and its no mere coincidence or luck---its part of a MANifestation formula. Im reverse-engineering the process and laying out the steps to inspire the single sisterhood out there. 5 Are you a self published author (Indie)? Yes and no. I have created a nano-publishing house that publishes my books. But its pretty dang indie in the big scheme of things. 6. Who's your favorite author? Hard to choose, but Ill say Erma Bombeck. She was pretty dang funny and quite bold for her time and place. 7. Your favorite book? Hmmm thats nearly impossible to answer; like a favorite song, it cant be narrowed down to just one. Or even one hundred.What book are you currently reading?I usually read several at a time. Lets see whats in the stack its Unbinding the Heart: A Dose of Greek Wisdom, Generosity, and Unconditional Love by Agapi Stassinopoulos from Hay House. 8. A book you would recommend? So many! Depends on what youre into. But Ill just say this: if you happen to be curious about Out-of-Body Experience (or astral projection as they used to call it back in the hippie era), definitely read William Buhlmans Adventures Out of the Body. And Robert Monroes books are wild and wonderful too. 9. How do you pick your books? Oh, its more like they pick me. You know that old adage, when the student is ready, the teacher will come? Its like that. Sometimes they literally jump down off a shelf, and other times Ill have it come at me three different ways from friends or websites or something. I read mostly non-fiction, but every once in a blue moon someone convinces me to a read a fictional work. 10. Advice for other authors? Be true to yourself. The world is a big mirror, so if you truly love yourself and whatever it is that youre doing, others will automatically like you and it too. Not everyone will, sure, but the percentage of negative feedback is there to show you whats going on within yourself in terms of love and approval. Its constantly changing. Dont get upset about criticism; use it as your gauge and motivation to accept yourself even more. 11. Do you write under a pen name? Nope. Once upon a time, the idea appealed to me, but Ive since come out of the creative closet and learned to embrace my dangerous writing. 12. Where do you write? I scribble in tiny notebooks during events when inspired, then get busy transcribing and editing on the computer in my cozy woman-cave womb-room. 13. What do you wear when you write? Ha! Fun question. What are you wearing? says the sultry voice on the phone. Well, I recently adopted Steve Martins tried-and-true method of putting a piece of baloney in each shoe---that way I feel funny while Im working. 14. Do you have a pet (s)? Do sea monkeys count? Actually I love cats and dogs but I usually just borrow my kitty-lovin from the neighbors. Its easier that way for traveling. And thats the way I like to enjoy children too---as somebody elses responsibility. Thanks again Debbianne and thanks for dropping in! It does sound like a great one! Thank you for your comment Liesel!